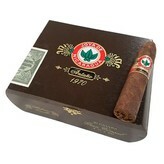 The Joya de Nicaragua Antano 1970 Gran Consul is one helluva cigar. Produced by Tabacos Puros de Nicaragua S.A., the Antaño 1970 is a powerful blend of Nicaraguan black tobaccos presented in a dark rosado Nicaraguan Criollo wrapper. Extremely peppery on the palate, this very potent cigar is overwhelming to many, while perfect for those experienced smokers who enjoy the very strongest of smokes.